It’s one thing to have an internet-connected device with access to an array of apps, but being able to do whatever you need on-the-go is amazing. A Google search first pointed me to #UberConference. Since I was already familiar with Uber as my go-to “other” transportation option, I didn’t have any doubts that they could make conference calls more enjoyable. After my conference call, #UberConference sent me a summary. That got me intrigued. So, when I tried to look them up on twitter I found an article from @cheapskateblog with this amazing coupon for six months free using the Pro version. What’s cool about #UberConference Pro? Any professional with limited resources should use this app. It might sound odd to call this a luxury because there’s no material object tied to my enjoyment. However, solving my “conference call” problem really brightened my day and helped make proper use of my precious time. 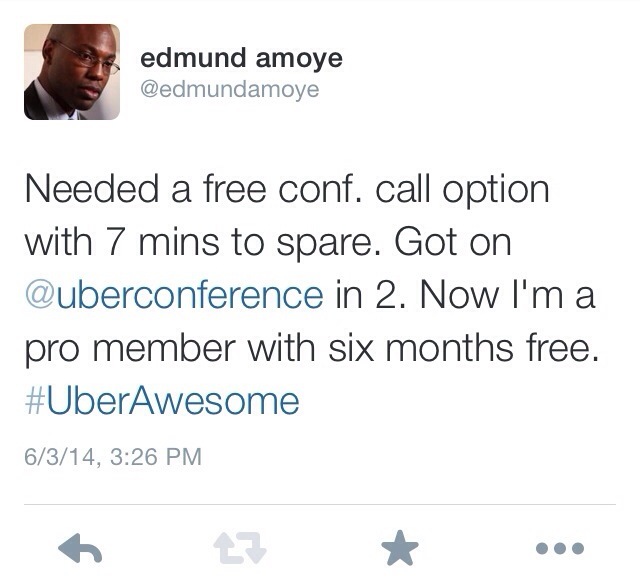 Everything about #UberConference got me excited – from the solution search to the mobile landing page. The text alert (with my access number) before my team conference, and the summary right after, were nothing short of awesome. And oh, one more thing….. I got so pumped about the value of #UberConference that I wrote this post in a space of 20 minutes from my smartphone. Didn’t even blink. So sorry if it doesn’t look pretty.